Mama Catherine Lahka, mother of Emeritus Christian Cardinal Tumi is dead. Mama Lahka died on June 8 at the St. Elizabeth Catholic Hospital Shisong in Bui Division, Northwest Region. Family sources told The Post that Mama Lahka was last admitted at the Shisong Hospital on May 14, 2015, and her conditions deteriorated and she slumped at about 10pm on June 8. Both Shisong Hospital and her residence at Kikaikelaki on the outskirts of Kumbo have been like a beehive as visitors and mourners keep trooping in. The SDO for Bui, Theophile Nseke, and other top administrative officials were among the authorities that paid condolence visits to the bereaved family in Kikaikelaki. 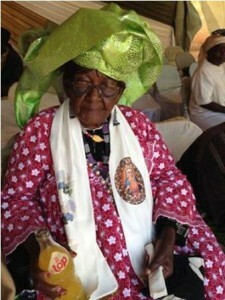 In 2009, Ma Lahka celebrated her 107 years on earth and when Cameroon Panorama’s Emmanuel Wirndzerem Verdzeka, caught up with her she spoke about her marriage life and her beloved son Tumi. On how Cardinal Tumi came to join the priesthood and whether it was easy for her to accept such a decision, Ma Lahka said; “|One day, he just told us he wanted to be a priest. We could not do otherwise. We gave all to God and I told myself; ‘God, if this is your will, let it be done’. It was first and foremost his choice, not mine. If my opinion was sought, I will still have given him the go-ahead to freely choose the path he wanted to follow in life. Back in Ibadan in Nigeria, many Moslem women asked him if he was not going to get married. Today, he is married to Christ and the Church. I understood priesthood from that of Fr. Paul Kerdzekov, whose mother was totally against his being priests since he was the only son. Ma Lahka, in that interview, said Cardinal Tumi was “never heady in his childhood and appreciated those who assisted them to bring him (Tumi) up while they were away in Nigeria.